When it first came out I couldn’t believe it. I was glued to the television set the whole week. But then … it went missing. It used to be called Mob Week, where I tuned in every night for seven nights to see my favorites: Robert DeNiro, Al Pacino, Marlon Brando, Joe Pesci, Chazz Palminteri and Ray Liotta among others. I’d be glued to the set watching some Martin Scorsese or Francis Ford Coppola movies I had already seen, seen with my Dad, and remembering our conversations about Vito Corleone, Henry Hill, Tommy DeVito, Donnie Brasco, Sam Rothstein and others. It was awesome. I knew the story, I knew what would happen, I knew the classic lines and I’d remember how my Dad and I would both have A-Ha moments over how great that line was at that very moment, and Mob Week brought some of that back to me. But the thing is, I’m not a violent person by nature and for some reason I found myself interested in these stories, and intensely watching them over and over again. It was a trip. I wasn’t part of that I want-to-be-a-gangster mentality either. But I guess I was interested in these characters and their stories and how they seemed to rise to power, using both brains and violence to get to where they wanted to be. I was interested in how the concepts of family, honor, and loyalty meshed with murder, racketeering, and violence. I was interested in how Scorsese and Coppola framed the stories and dialogue that would pull me into this world. Even the small biographies about the original mobsters peaked my interest. So when Mob Week mysteriously disappeared, I was left feeling bummed out. Fast forward to 2015 and mob madness returns to the Guat household. Thanks to AMC. I saw the promo for Mob Mondays and I was ready to block all calls and set the DVR just in case. For eight Mondays in a row I’d be treated to some of the best mobster movies out there plus a bonus. An original series brought to me by the same people who brought me Mad Men and Breaking Bad would follow. I was like …yes! Yes AMC! Yes! 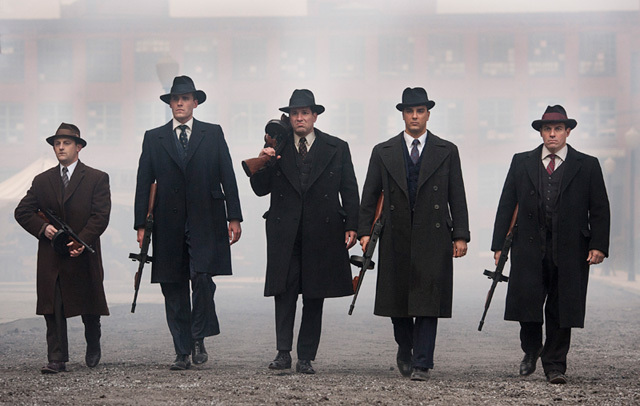 On Mob Mondays The Making of the Mob: New York, I’d get the scoop on Charles Lucky Luciano, Meyer Lansky, and the rest of his crew. I’d get the rise and fall. I was excited about it and interested in how the their minds worked, how they felt capable of putting it all together, and how eventually death, the IRS, or FBI would eventually catch up to them. That whole world interested me, it’s complicated and violent dynamic. I couldn’t really explain why, but it just did. The story did, and for the next eight weeks, I’d be able to catch these attention-grabbing stories, and Mondays would have a new meaning. I was, like you, always attracted to the apparent dichotomy between honorable family men who committed violence and perpetrated crime. I think I’m drawn to the fact that they did not simply choose a path of simple compliance. The don’t follow the rules! I love mob movies to the angsts of many of my friends and colleagues. Yes! It’s definitely an interesting perspective and I love watching them, they trip me out how they still break the law but have rules within their own families. It’s a trip. Goodfellas and The Godfather I and II are my favorites. There is a definite fascination with watching the stories of the men who lived that kind of life, so different from our own. I think we are always intrigued by the “other side.” I, too, enjoy watching those wonderful actors portray the men of violence. I’m so glad that there are so many others out there that love watching this too, but don’t necessarily want to join the “family”. There are some pretty great characters in there. This Mob Mondays is pretty great. The guy who plays Lucky Luciano is really good. So, I know I’ve been away for a while. So sorry. BUT I HAD to see what this Mobster Monday thing was about–what with my father having been a bookie for the mob and all. You’re right, mafia stories can be compelling, especially when the “bad” guy is somehow so appealing, despite his flaws. My dad was like that. Just so you know. This summer I’m going on two-month RV trip with my nearing-ninety Godmother and her cat Pepe le Mew. I leave for the US in a week. The RV is huge, 37-feet. My Godmother will be driving and towing an SUV the entire way. She was a Flamenco dancer during her entire professional life. I’m going to try to blog about our trip and write a book about the 64 beautiful years she and my Godfather, a Venezuelan movie star (I kid you not! ), were married, until Raul died last fall one month shy of his 97th birthday. Hope you are well and Mobster Monday continues. Again, sorry to have been away so long! HEY!!! I’m so happy to hear that you’re back! How was your blogging hiatus? I bet you got some stories to tell. I love that you are exploring the states in an RV. Love it! I wrote a few articles on camping and RV life a while back, duuuuude you’re gonna love it! I’m excited for you. And I totally thought of you when I found out about Mobster Mondays, thought you’d find it interesting, Ray Liotta produced it and narrates it. I find it so fascinating Lucky Luciano’s story is a trip….Smart and Dangerous, killer combination. Hope you get a chance to check it out. Now you will die. I watch The Bachelorette on Mondays. Ha! I can hear you laughing right now! It’s my guilty pleasure…. Don’t worry. I’ll record some of these classics! Duuuuuude you and BrickHouse chick are killing me with this Bachelor business. But as long as you get some good TV in then I’ll forgive these puff pieces. Definitely check that out!